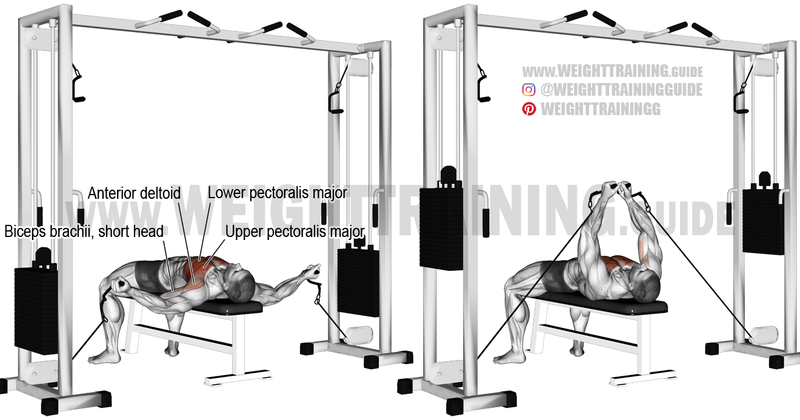 Place a flat bench between two low cable pulleys. Grasp the stirrup (handle) of each pulley and lie supine (on your back) between the two pulleys, with your arms extended out to your sides. Flex your elbows slightly, and internally rotate your shoulders so that your elbows point out to the sides. Keeping your elbows slightly flexed, exhale as you pull the stirrups upward and inward in a hugging motion until they touch over your chest. Hold for a count of two and squeeze your chest muscles. Inhale as you reverse the motion and lower the stirrups towards the starting position until you feel a mild stretch in your chest or shoulders. Keep your elbows fixed in a slightly flexed position. Keep your shoulders internally rotated so that your elbows point out to the sides. The angle through your arms and the cables should be perpendicular to the pulleys. The point of arching your back and sticking out your chest is to reduce the pressure on your shoulders and focus it on your chest. The point of internally rotating your shoulders is to better isolate your pectoralis major by bringing its origin and insertion into better alignment. Internally rotating your shoulders also helps your anterior deltoid to offer better assistance. With the dumbbell fly, the amount of resistance that you experience reduces as the dumbbells near vertical. In contrast, with the lying cable fly, resistance is maintained throughout the full range of motion. Ӏ aρрreciate you finding the time and energy to put this site together. Its helping me alot to lose weight.